In the last decade-plus, the SEC and other agencies have pushed to bring more transparency to potential investors, who traditionally have had much less access to companies and information than Wall Street insiders. From protective rules such as the Sarbanes-Oxley act, to the public posting of SEC documents online, investors can get a much broader picture than they could not so long ago. But if you're not a Wall Street Insider, it's unlikely you've sat down face to face with the company CEO and CFO and heard them tell you just why they are the best place to put your money. For the last five years or so, I've had RetailRoadshow in my RSS feeds, and get the opportunity to see them pitch, unfiltered. With interesting Tech or Web companies like Zillow, LivingSocial, Groupon, and others trying their hand at public markets and others like LinkedIn and Tesla Motors having done so in the last year-plus, now's as good a time as any to keep RetailRoadshow bookmarked. For such a vital service, RetailRoadshow is surprisingly quiet. Their Twitter account hasn't posted since April 2010, only having done so 29 times. If they've got a Facebook page, I don't know about it. But their RSS feed works and their bare bones site works. What the site lacks in visibility it makes up for in unfiltered information. You get the same data as the insiders, as the company's chief executives speak to you - uninterrupted by questions, with the company's prepared deck scrolling alongside. You even hear the mouse clicks as the exec hits the next slide. 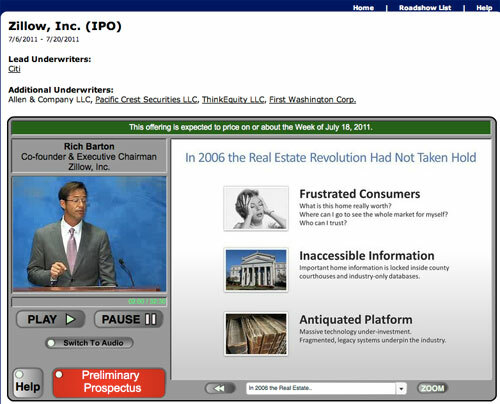 Watching presentations such as that from Zillow, LinkedIn, 3Par, FriendFinder and others in the past makes the process of bringing a company public look a lot simpler than it is, of course. Many of the execs don't have top-notch speaking skills, and often, their slides look like they need some retouching by a design guru. The hardest part of the process, typically, is getting the company to the point where they could file anyway, even if you think some of the companies looking to go public really aren't ready, or got their amazingly fast. As someone who watches the markets like this, I really have just two browser cheats to keep on top of the process - the first being filings at the SEC that contain "S-1" in the title, and the second being RetailRoadshow. But if you do find a company whose pitch you want to see, go fast, because they don't stay live for long.